I am a student of relationships – sibling relationships; friendships; spousal relationships; parent-child relationships; neighborhood relationships; power relationships; workplace relationships; political relationships; spiritual relationships. I have studied and observed; read and taught; struggled and delighted; and have committed myself and my work to the healing of relationships and the development of life-giving, sustainable relationships that (in my mind at least) reflect the desire of God for us, God’s beloved. Thanks to the recommendation of a friend and colleague, I discovered the work and teaching of Dr. Marshall Rosenberg in his book, Non-Violent Communication. While it might be easy, at first, to imagine that this book is for those who have a hair-trigger temper, or for those who live in violent and dangerous environments, it is – in fact – a book for all of us. Rosenberg asserts that we do violence to relationships – even, and maybe often, those relationships most precious to us – by judging one another. It happens all the time, often in subtle ways; and without being aware, we erect defenses between ourselves and those around us to protect ourselves from the hurt – and violence – we experience when we are judged by another. In some ways, it’s no surprise. 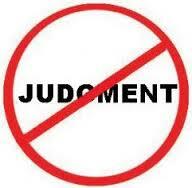 Judgment happens all the time, all around us. We live in a world that values either/or, red/blue, liberal/conservative, right/wrong, in/out. We need only turn on the TV, the radio, or connect to the web, to hear rhetoric on all kinds of issues that underscores the value of ‘being in the know’, of winning, of having the final word, of getting what we want before someone else does. I believe, though, that we all suffer from this way of being; this way of relating; this way of parsing the world. Most of all, our relationships suffer – and with that, our freedom to be fully human. When I’m talking and I get interrupted (observation), I feel anxious (feeling). I need to get my whole thought out (need). I’d like you to wait until I’m finished talking, and then give me a moment to make sure I’m done, before you speak (request). You always interrupt when I’m talking! I forget what I want to say. You really make me mad. I don’t want to talk any more. Sunday, April 6 at 10:00 a.m.
Do you seek a community of leaders with whom you can speak freely, explore organizational values and dream big? Would you like to develop your leadership style through interaction with leaders in the forefront of energized and values-driven organizations? Are you looking to deepen your own spiritual awareness and resources to sustain you through leadership and organizational challenges? Would you like to develop communication skills that can guide your organization to better support and affirm all of its members? Do you sense the need for change to help you break through to new possibilities? Saturday, May 10 at 7:00 p.m.
Sunday, June 15 at 9:15 a.m.
Susie–I love this. All faculty at Hotchkiss are being asked to go through a NVC training–most specifically for classroom learning and teaching/evaluation–over the next few years. I have not done it yet, but will be learning more about it soon! It may seem contrived, but so much more useful for everyone involved. And, the more you use it, the less contrived it feels! Thanks for sharing! xox. How great to know Hotchkiss is engaging NVC for use in classroom and teaching/evaluation. I look forward to hearing about your experience with it, and your overall sense of how it is being used on campus. Thanks, Annie! I love how you start this piece by talking about how you are a student of relationships, and then connect that to the power of nonviolent communication in all kinds of relationships. Like you, I find the NVC process so simple in concept, yet so (embarrassingly) hard in practice. A life-long journey of learning!